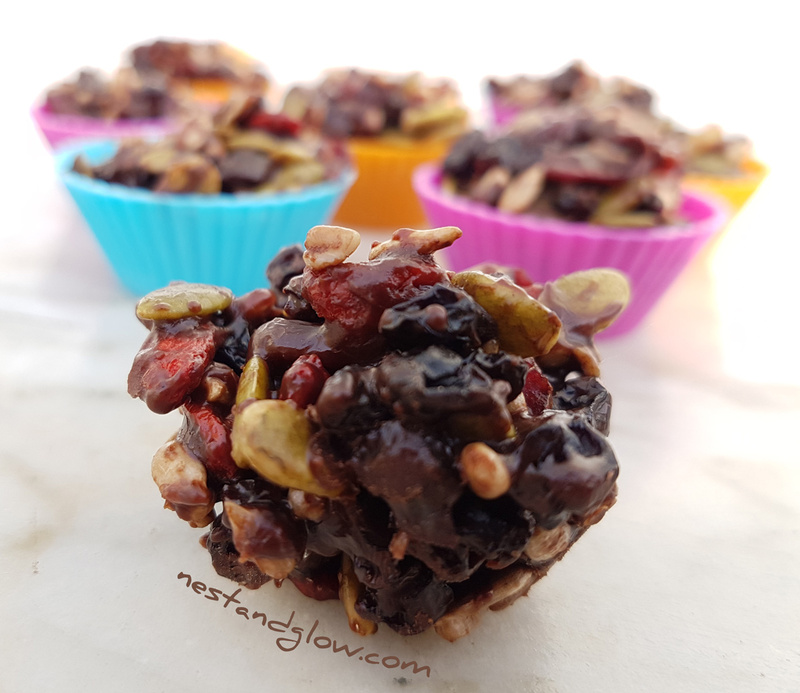 These raw chocolate bites are a great mixture of chewy fruit and crunchy seeds. Easy to make and high in protein, heart-healthy fats, vitamins and minerals. The perfect filling healthy snack for either after or between meals. A couple of these will count towards 2-3 of your 10 portions of fruit and vegetables a day. Dried fruit and seeds all count towards and 10 a day and this target is easy to reach on a plant-based nutrient-dense diet. These are vegan, raw, gluten-free, paleo, nut-free and refined sugar-free. Melt the coconut oil or butter. Mix together the sweetener and sifted cacao powder with the liquid coconut fat until combined. Stir in the fruit and seeds then spoon into your mini cases. Chill until set then enjoy. Best eaten within a few days while the seeds are still crunchy. Can be frozen. Equipment: Double boiler and small cup cases about 1″ in diameter. If you don’t have the ingredients for the raw chocolate then an alternative is to melt a bar of your favourite chocolate. About 100-125g is the right amount for this recipe. The seeds and fruit used are just a suggestion, you can use any that you like. I think hulled hemp seeds and apricots also work really well in this. 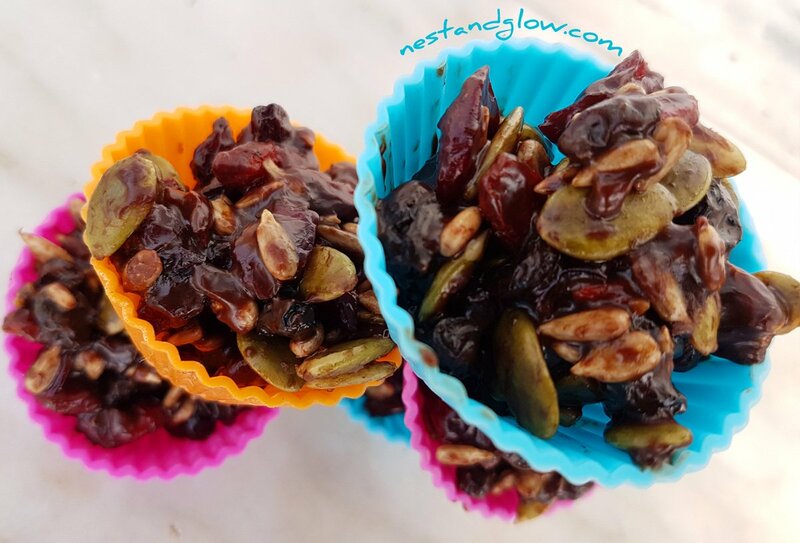 The one fruit I always like to add is dried cherries as the sweet and sour tartness balances really well with the bitter cacao. When choosing your fruit I suggest getting fruit that has no added sugar or is sweetened with pineapple juice. I usually make these with homemade Coconut Butter as still has the fibre from the coconut. This makes it more filling and less refined. But coconut oil works just as well, just remember to always use a raw virgin coconut oil. A good raw virgin coconut oil will have a strong coconut fragrance. If you have time I would recommend to soak and sprout your seeds. See the activated almond butter for information about soaking, sprouting and drying nuts and seeds. These can be made caffeine free if you use carob powder instead of cacao. I’m using silicone cases here as they are re-usuable, last for years and hold their shape without needing to be placed into a pan.